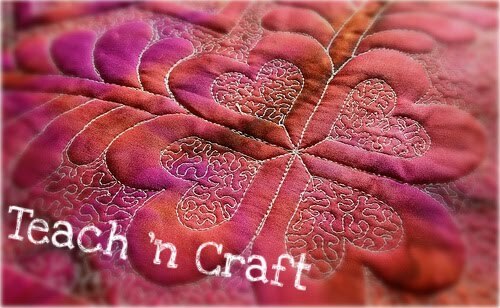 Teach 'n Craft: So much catching up to do! 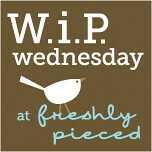 So I've been away from the blog awhile, and a good friend told me I had to get back to it. I have no more excuses--school's out and I've actually been spending my "free" time making things again! Now, my problem is that I have so much to share! So, I think I'll hop around the last few months of happenings as the spirit moves me. This past Sunday was my dear husband John's birthday. It was a crazy day. We were in Ohio visiting his very sweet grandparents and got an email from our realtor (yep, we're buying our first house!) saying a place just went on the market in the neighborhood we love. We left Ohio earlier than planned, went to the open house, wrote an offer, and then heard today that we unfortunately didn't make the cut (three offers!...the house was on the market for 3 days total). But, we have lots of time left in the summer to shop. We're a bit disappointed, but not crushed. Then we were back on the road to Youngstown, OH. On Saturday I had the absolute pleasure of taking Grandma Rene to a new quilt store in the town she loves. She's so proud of Youngstown and talks about their art gallery and symphony constantly! She's even been a part of getting the author of Downton Abbey to come speak at their library. Anyway, she's actually the quilter that got me started on the quilting bug that has not stopped since I slept in her craft room and admired all the handmade quilts on her walls two years ago. She hasn't quilted in a while so it was a treat to see her admire all the new bright fabrics. She's so precious! I wish I had a picture with her! 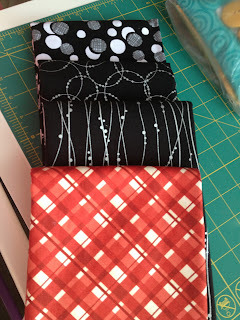 I do have a picture of the fabric. Anyway, if you're ever near Canfield, OH you have to check out the Village Quilter. 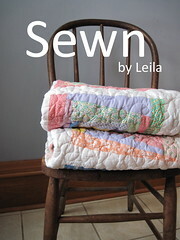 They have a selection of bright and more muted fabrics because two sisters with opposite tastes own the shop together! I've been in a lot of quilt shops, but I really felt at home in this one. I got the feeling people just stopped in to have a conversation with the owners--I would! They have lots of great notions, hand-dyed wool felt and embroidery floss, and many patterns to go along with their fabrics and precuts. The highlight of the trip was going into Rene's storage locker. 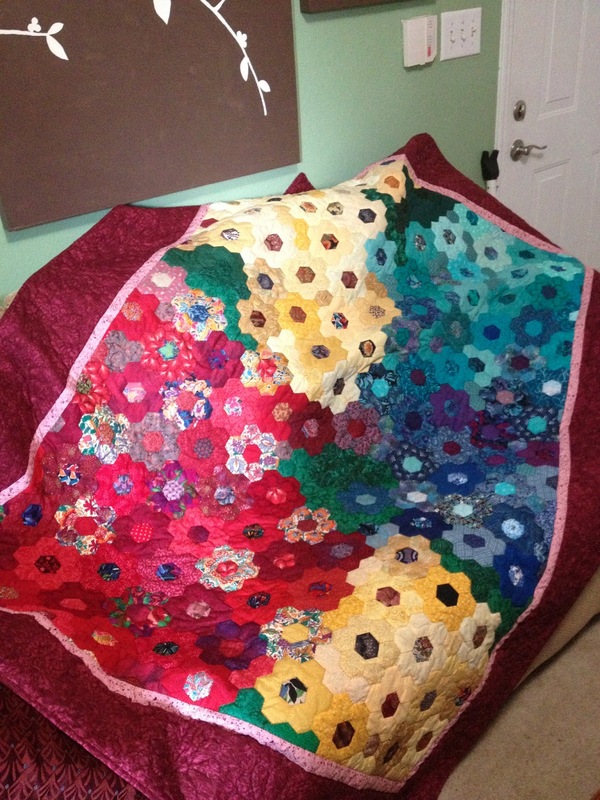 They recently downsized and she had a plastic tub full of quilts that no longer had a home. And the very last quilt at the bottom of the tub was the beautiful quilt that was my original inspiration. It's now at home with us where it will be treasured for the beautiful handiwork that it is.